Technology has got to the point where there really is no reason why every detail cannot be planned accurately prior to setting up an event. Technologies exist which allow us to model the PA performance, visualise the lighting design, plan the sight lines, determine load ratings and so on. Key to all of these is accurate plans, generated by computer aided design (CAD). CAD software is more than pretty pictures. It is a mathematical representation of the real world which can be manipulated in various ways to deliver information that you, and all stakeholders need. As events get more complicated, CAD saves time an money because it gives the ability to pre-visualise the setup and make changes before things get expensive. Vector images have some advantages over bitmap images. Vector image files tend to be smaller than bitmap images because a bitmap image has to store colour information for each individual pixel that forms the image. A vector image just has to store the mathematical formulas that make up the image, which takes less space. Vector images are more scalable than bitmap images. When a bitmap image is scaled up you can see the individual pixels that make up the image. When a vector image is scaled up, the image is redrawn using the mathematical formula. The resulting image is just as smooth as the original. The standard file format for CAD files is usually either DWG or DXF. DWG is a propriety format that is owned by Autodesk. To make things more complicated, there a 18 versions of it! Despite this, it is probably the most widely used format for CAD drawings because it is the native format for Autocad, the world’s most popular suite of CAD programmes. When used outside the world of Autocad, it can be problematic. To solve this, DXF was developed (also by Autodesk) which stands for Data Exchange Format. This file format was created for enabling data interoperability between AutoCAD and other programs. It has become a de facto interchange standard if you like. 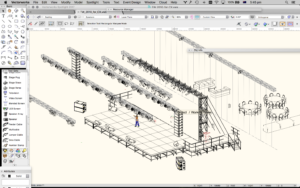 So, what is the process for planning an event using Cad software? It starts with getting a floor plan, preferably in either DWG or DXF form. Unfortunately though, that rarely happens. Absurdly, a lot of the venues I work in, guard their CAD files as they claim it is their intellectual property. In reality, it is the in house AV companies trying to make your job harder. However, you can usually work with a PDF by using a service such as Online PDF to DWG Converter. This converts the PDF into a form that can be edited in the Cad software, and scaled accordingly. Talking of software, what to use? Autocad is well known but it does not get a lot of love in the production industry. This is because it is expensive, and it isn’t optimised for event production work. 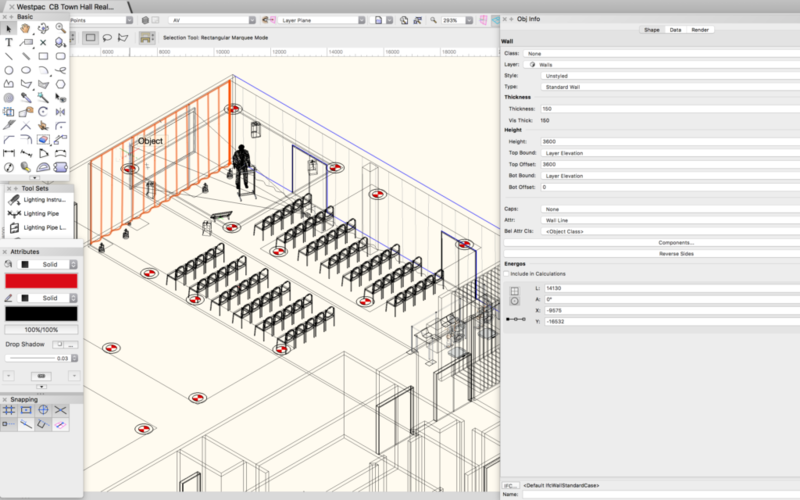 Vectorworks Spotlight is the gold standard for CAD in our industry. It is a powerful 3D product that comes with a lot of built in tools specifically for production work such as stage sections, truss, lights, video displays and so on. It also has numerous addons for rendering realistic images and visualisation as well as superb user support. Indeed, in Australia the support phone is often answered by Peter Neufeld, a highly experienced and respected theatre lighting designer so when you talk industry tech, he knows exactly what you mean. For those with simpler needs, Turbocad Deluxe is much cheaper (like 150 bucks) and is adequate for many routine layouts and floor plans. A couple of the major In house AV companies use Turbocad because it is cost effective and their requirements tend to be simpler. Don’t want to spend any money? Download a free copy of Draftsight. Draftsight is a 2D vector CAD package which borrows heavily from AutoCAD. It is not bad! So the floor plan has been imported. Imports rarely work without needing to be tidied up and most importantly, remove what is not needed. There can be literally thousands of items that aren’t needed so by removing them, the file size becomes smaller, so your computer performs better, and makes the final document clearer to understand. Then scale it precisely to real world dimensions and verify them. Errors in supplied plans are common. Then put the floorplan on it’s own layer and lock it. What’s a layer? Layers are independent drawing spaces that stack on top of each other to create an overall image. Think of them as layers of paper that you can see through. Layers are great for keeping things organised. For example, you may have a floor import layer, a ceiling layer with rigging points, a layer for staging, audio, lighting, video and so on. Time to get creative! Whatever software you use, efficiency and speed lies in the use of symbols (sometimes called blocks). Symbols are just drawings of items that you use a lot. For example, if you own some QSC K10 speakers, you’d create a symbol of it, and save that symbol to the hard drive. Then, whenever you need a K10 in a drawing, you simply insert it rather than drawing it again. Drawings with lot’s of the same symbol in them are more efficient because the software only needs to draw it once, and then duplicate rather than drawing individual items many times. I have a massive symbol library that I have built up over many years. Basically, if I know something is going to be needed more than once, I make a symbol of it. Desks, chairs, tables, lights, whatever. Now I can put together a plan quickly because I have the components. I’m a Vectorworks user and it comes with a huge library of production symbols. Manufacturers are a great source of symbols too. Most have DXF files of their products that can be quickly converted to symbols. Templates save time too. A template is just a blank document that contains your preferences as well as you printing layouts, logos etc. It saves a lot of time because things are set up the way you like it. Now, get to love keyboard shortcuts and entering data manually. The reasons for this is that you want to be fast, but you really want to be supremely accurate. With these tools, you can design and plans things to the millimetre, so why wouldn’t you? By using a mouse, you create the possibility of small errors which can build. Care needs to be taken in outputting your files. Let me tell you of a job that I am only just getting used to telling. In 2003, I was commissioned to do a job in Christchurch, New Zealand. At the time I did not have any contacts but after some quick research, I found a recommended set builder with the skills that we needed. We emailed some plans over for quoting purposes only. When the contract was awarded, my designer produced a full set of scale construction plans, printed them out and posted them to Christchurch. 6 weeks later I am standing in the Christchurch Convention Centre supervising the load in and the set truck arrives and starts to be unloaded. I’m watching a few panels come out and I think to myself “they seem small” but I reserve my judgement because it would be unfair to make judgement until things go up. But then my custom made lecterns come out and they are definitely small. Great for a dwarf convention, but not what we needed! It was at that this time we confirmed that the entire set was the wrong size! The whole thing was 11% smaller than it was supposed to be. This, as would expect, did not make for a good day! The set builders used the wrong set of plans. They used the quoting set and printed them out and used the “fit to page” function on their printer which shrunk the scale drawing by 11%. The plans did have a scale on them but they never referred to them. As a result, they diligently cut and built everything to the wrong scale. I was in my very own Spinal Tap/Stonehenge moment! What really pissed me off was the fact that they never phoned me despite admitting to wondering why all the dimensions were non standard. Muppets! This highlights the need to get the printed documents set up correctly. Always, always, always include a scale bar and note the scale. Try to avoid using non-standard scales and check they are correct once printed. If big plans are needed, make a AO size PDF and email it to a plan printer. An AO size print only costs about $5 in black and white and is invaluable on large jobs. A significant investment in time is required to get the best out of CAD software but once you know how to use it effectively, you find yourself using it all the time. As well as planning my jobs, I’ve a designed a house, the garden, my wife’s flower shop, lot’s of woodwork jobs and designed super accurate metalwork. I give the DXF file to fabricator, he loads it into his CNC machines and waterjet cutters. This provides incredibly accurate work that I’d never be able to achieve on my own. Good CAD skills serve you a lifetime. It is worthwhile making the effort to get good at it. Draftsight – Entry Level 2d CAD software with full DWG and DXF compatibility that borrows heavily from AutoCAD. Has a free version. I am a contributing writer to CX Magazine. 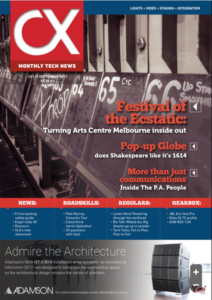 CX Network is the voice of technicians in entertainment and audio visual across Australasia.